April 2017. Vol. 21, No. 1 & 2. — Welcome to 20 Years of CultureWork: A Periodic Broadside for Arts and Culture Workers! Culture workers occupy the liminal borderland spaces found within disproportionate levels of creative and social capital, arts and audiences, artists’ economies and political mechanisms. The arts–and those who design, plan, and manage them–take audiences beyond their everyday experiences. They supplement and enrich educational opportunities and political discourse. They offer new perspectives and inspire original questions, thinking, research, and creative work. They push and extend the limits of capability, possibility, and expected outcome. Culture workers delineate the responsibilities, functions, and points of access associated with creative cultural expression in artistic spaces characterized by an embrace of diverse thought, identity, and social formation. They are artists, leaders, and advocates for the arts who guide social, political, and economic responsibilities to make the world more. MORE activates, enlightens, and strengthens the field. Desire to make the world more vital through the arts and continuing actions of arts and cultural management, education, advocacy, and policy work are found in this double-issue celebrating 20 years of CultureWork: A Periodic Broadside for Arts & Culture Workers. Authors from throughout the past 20 years of CultureWork have developed a compendium of concise articles and visual responses to significant 21st century arts and cultural management developments and perspectives associated with the topics of their original essays or artwork. By hearing from multiple, wide-ranging author voices, the journal continues to uphold its democratic core, vitalizing cultural work by being more…. More liveable and just through adherence to creative democracy and cultural inclusion as described by Doug Blandy and Miguel Juarez. More essential to intellectual and political life as found in Anne Katz’s rationale for continual arts advocacy and Jodi Kushin’s discussion of the critical work of artists as public intellectuals. More intrinsic embodied research as described by James Sanders and visualized by Risa Bear. More holistic by connecting with community/school partnerships and STEAM education as articulated by Mary Ann Stankiewicz and Ann Galligan. More aesthetic and active as found in Michael Geraci’s considerations of web design, Elizabeth Tanenbaum’s explorations of sustainability practices for public art; and Alice Parman’s outlining of recent trends in museum practice. More beneficial to specific geographic and community settings as detailed by Savannah Barrett or to audiences and programs through tools shared by Robert Voelker-Morris. More participatory and accessible as described by Craig Saper and Emily Hope Dobkin. More flexible as identified by Laurie Dean Torrell and Elizabeth Hoffman. More analytic and forward thinking for community, nonprofit, public, and private arts sector organizations as described by Susan Appe and David Pankratz. More practiced solidarity as shown in the work of Lynn Susholtz and Helen de Michel and championed by Victoria Plettner-Saunders. More engaged belonging and efficacy as identified by Brian Weaver and Deborah Snider. CultureWork continues to be a voice for practitioners in the fields of arts, education, policy, and community. I hope each of you finds an insight from these articles that stands out and activates your own work to encompass the vital more of culture work. 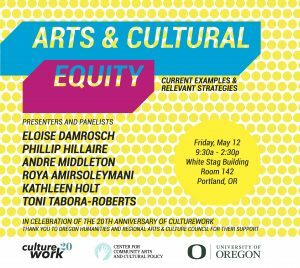 As always, I look forward to hearing from you and continuing these conversations through this publication and community engaged events such as the Arts & Cultural Equity forum described below.